Notes: Riber Castle is a 19th-century Grade II listed country house situated in the hamlet of Riber on a hill overlooking Matlock, Derbyshire. Known locally as "Smedley's Folly" because of the difficulty of getting water to the hill summit, it was built by John Smedley in 1862 as his private home. His wife lived in it until her death. It is built of gritstone from a local quarry (Derbyshire is well known for its quarrying) which was pulled up the 200-metre (660 ft) hill by a series of pulleys. After the death of Smedley's wife, the castle became a boys' school until this became financially unsustainable in the 1930s. With the coming of World War II the Ministry of Defence used the site for storage. The MoD left following the war and the castle remained unused until the 1960s. From the 1960s to September 2000 it was home to a wildlife park, containing British and European fauna. 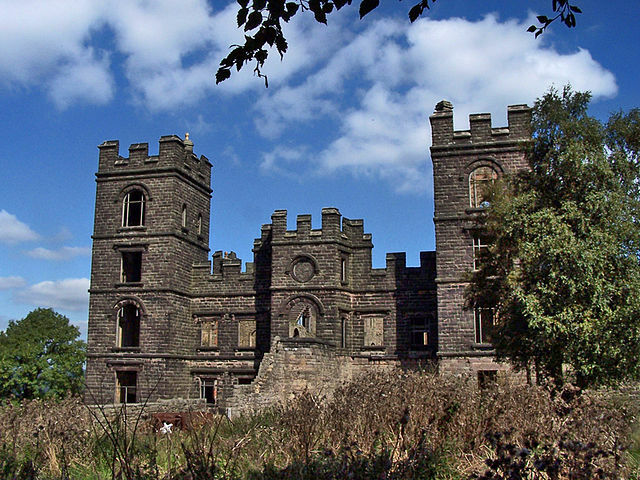 Riber Castle Wildlife Park, or Riber Zoo as it was known, was eventually sold by the owner, but they were unable to sell it as a going concern, and so the park eventually closed. The park was criticised heavily for the treatment of the animals kept there, and the closure was not without controversy.Activists also released several lynxes from Riber Zoo which escaped into the wild. Plans to turn the shell into apartments received planning consent on 15 March 2006. The castle walls have now been secured, chimneys and floors rebuilt, 119 windows replaced and a roof added. It is expected that two show apartments will be ready some time in 2014. Access to the site before 2006 was securely restricted, until the perimeter fence was unwired to provide unrestricted access to the site, which later became a commonly used footpath. However, recently developers have added a second (more secure) fence, boarded up all entrance points and have manned security onsite. The castle and the town of Matlock are key locations in the Shane Meadows film Dead Man's Shoes.